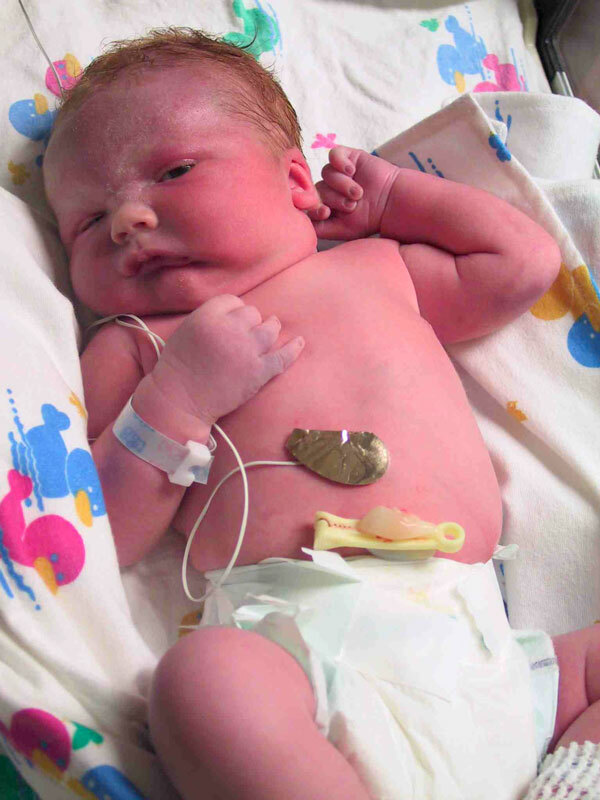 This is Gabriel Wade Topping, born October 8th, 2003 at 5:10 pm. He weighed in at 8 lb. 15 oz. and was 20.5 in. long (three weeks premature). Labor was induced beginning about 11:30 am. Pushing only lasted 10 minutes before he shot out like a torpedo, causing him to nearly be dropped by the O.B. (literally). The bruising you can see is evidence of his swift passage and perhaps of the hands (the OB’s and his dad’s) grabbing him before he landed in the garbage can. Yes, his hair is red. He had a little trouble keeping his blood sugar up and spent 12 hours in the NICU for monitoring and several days in the hospital for light exposure and to establish his ability to eat. Mom (very sore from the experience) and baby came home today. Gabriel’s big sister is happy to have him home, so far. Maisie witnessed the birth and was heard to squeal when he came out. Later she gave a graphic description (including gestures) to a nurse in the hall. She charmed all the hospital staff of course.